The Constitutional Court stated: the legislator may not bind the administrative organ that adopted the decision of first instance to carry out the procedure of second instance as well, unless there is a higher forum within the affected administrative organ that has the relevant competence. The Constitutional Court annulled the provision of a Government decree that appointed the Government Office of Pest County, acting on first instance in certain cases, as the organ entitled to decide about the appeal as well. The Constitutional Court stated: the organisation performing a public duty has to disclose the data of public interest and the data public on grounds of public interest that are typical of its activity or that have been created in connection with its activity. According to the Fundamental Law, the organisation performing a public duty is not obliged to create a list of data containing new data. The applicant for the disclosure of data shall not be entitled to claim that another entity sort out the data available instead of him. The petitioner requested, in the framework of a scientific research, by way of request of data disclosure in the public interest, the Curia to disclose the list and certain data (case numbers, date of submitting the statement of claim, names of the litigating parties in the case of legal entities) of civil litigations pending for at least seven years. However, the Curia stated that it could not provide the requested list of data as it does not have a record on the dates of submitting the statements of claim. The Constitutional Court pointed out: the request for data – not exercised in an abusive manner – should not be refused by referring to the extra work implying time or costs needed for making the requested data accessible. Nevertheless, a differentiation should be made concerning the case when the request for data is not aimed at disclosing data retrievable with additional work, but for inducing the controller to obtain new data or create data of another quality, statistics or a statement from the data it processes otherwise. By referring to its consistent case law, the Constitutional Court first pointed to the importance of the freedom of information, underlining that the openness of the operation of the judiciary, as a separate branch of power, does not differ fundamentally from that of other organisations financed from public funds. The Constitutional Court also emphasized that the duty of the Curia is to develop the uniformity of the case law of the courts and, primarily, to decide about extraordinary legal remedies. The date of the submission of the statement of claim and the connected duration of the procedure reaching or extending over seven years – although it is deductible from the court files – is not considered as data created in connection with the Curia’s activity or the performance of its public duties. The Constitutional Court also noted as a significant fact that the Curia has no monoply over the information requested to be disclosed as the court of first instance, in accordance with its duties specified in the procedural Acts, necessarily contributes to all essential points of the civil procedure, including the registration of the date of submitting the statement of claim. By taking into consideration all circumstances, the Constitutional Court rejected the petitioner’s constitutional complaint. Justice Dr. Béla Pokol attached a concurring reasoning and Justice Dr. István Stumpf attached a dissenting opinion to the decision. The full text can be accessed here and the data-sheet of the decision is available here. The Constitutional Court prohibited the application of one of the provisions of the Act on supporting families that had been in force in 2018. As the Constitutional Court underlined in its decision: formally granting the judicial way is not sufficient in itself to comply with the requirement of effective judicial legal protection. The procedure of the Constitutional Court was based on a judicial initiative. The initiating judge had two pending cases where the authority obliged the plaintiff to repay training benefit and schooling support obtained without legal basis. Both plaintiffs had submitted applications based on equity by referring to transferring the support to the beneficiary, however the authority rejected – in one of the cases, partially – the applications due to formal deficiencies. The plaintiffs applied for the court review of the decision, but according to the challenged provision of the law, only nullity may be claimed in an action started against a decision made in the scope of equity. According to the initiating judge, in the absence of real and effective protection of rights, the right to fair trial and the right to legal remedy are violated. The Constitutional Court pointed out: it is the essence of every legal remedy that the designated forum should be actually capable of remedying the injury of right – the mere fact of formally providing for using the judicial way is not sufficient. Although equity offers a wide scale of discretion for the authority, it does not mean that a decision passed in this scope may be left without judicial control. The challenged provision narrows down the scope of the errors to be reviewed to the causes of nullity, but it does not allow the weighing of evidence and the sanctioning of the breach of fundamental rules of procedure and neither does it allow for applying any legal consequence other than annulment. As the challenged regulation unnecessarily restricts the right to legal remedy and the right to fair trial, the Constitutional Court stated that the relevant provision is contrary to the Fundamental Law and banned its application in pending cases. Justice dr. Béla Pokol attached a concurring reasoning to the decision. The full text can be accessed here and the data-sheet of the decision is available here. The requirement of fair trial should not be injured in any official procedure, although the exact set of requirements may be different in the particular procedures. The Constitutional Court established: there is a lack of conformity with the Fundamental Law manifested in an omission, as the legislator failed to regulate the protection of the confidentially handled data of the witnesses when they fall under the scope of different Acts of procedure. The Constitutional Court called upon the Parliament to meet its legislative duty by 31 December 2019. According to the decision of the Hungarian Competition Authority, the legal predecessors of the company petitioning the constitutional complaint committed a breach of the law when they held consultations about the prices of certain milled wheat products and they also divided the market between each other. The authority imposed on them a fine in the amount of HUF 1,000,000,000. At the beginning of the procedure, one of the companies that had participated in the cartel admitted the breach of law, provided detailed data about the operation of the cartel and its representatives subsequently became protected witnesses. The petitioner holds that – due to the false interpretation of the law by the Competition Authority – the witness received the status of “special protected witness” without any connecting procedural guarantees. According to the petitioner, the hearing of protected witnesses and using the relevant minutes as pieces of evidence violated the petitioner’s right to fair trial and the right to defence as it had no opportunity to verify whether the hearing of the protected witnesses took place in compliance with the procedural principles. The Constitutional Court pointed out: the official procedures carried out in the cases of cartels may imply negative consequences similar to condemnation under criminal law for the person subject to the procedure, however, punishments seriously restricting the fundamental rights (e.g. imprisonment) shall not be connected to the anti-competitive behaviour. The competition supervision procedure is not a criminal procedure and the protection of witnesses in the administrative procedure does not need to provide the full scale of guarantees to the clients in the same manner as under criminal procedure law. The Constitutional Court held that the challenged regulation appropriately protects the right to personal data of the protected witness against the rights of the client of the official procedure, therefore it has rejected the relevant petition. The Constitutional Court then examined whether the regulation of “protected witnesses” enforced in administrative procedures was in line with the requirements deductible from the Fundamental Law. Regarding cases of cartels, there can be a competition supervision procedure, an administrative action, a civil action, or – in the case of public procurement cartels – a criminal litigation as well. In these cases the participants of the processes of taking evidence are almost the same ones. There can be a case when the identity of the “protected witness” under the competition supervision procedure is revealed in another court procedure. This may affect adversely not only the person of the witness, but also other participants of the procedure. Based on the above, the Constitutional Court called upon the legislator to adequately regulate the protection of the witnesses’ confidentially handled data also in the case of different procedures. Justices dr. Ildikó Hörcherné dr. Marosi, dr. Béla Pokol, dr. Balázs Schanda and dr. András Varga Zs. attached concurring reasonings, and Justices dr. Ágnes Czine, dr. Egon Dienes-Oehm, dr. Balázs Schanda, dr. István Stumpf and dr. Mária Szívós attached dissenting opinions to the decision. The full text can be accessed here and the data-sheet of the decision is available here. 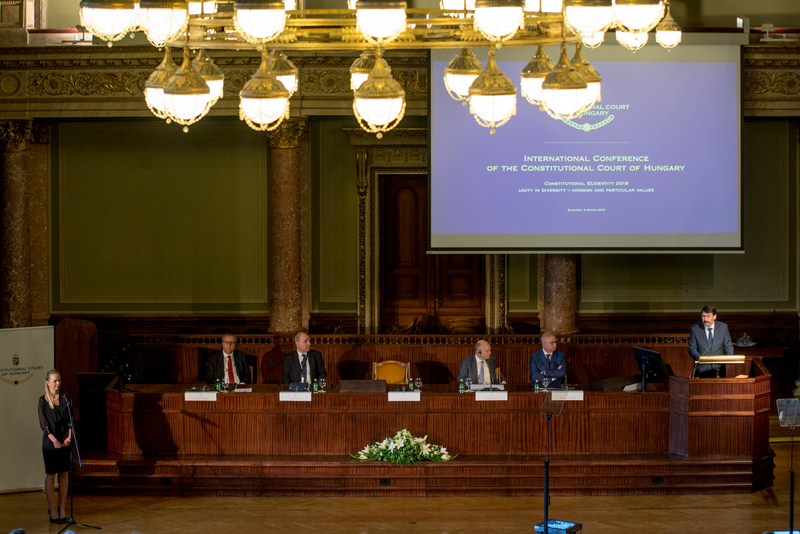 For the first time in the history of the institution, accepting the invitation of the President of the Constitutional Court, Koen Lenaerts, the President of the Court of Justice of the European Union and Andreas Voßkuhle, the President of the German Federal Constitutional Court arrived to Budapest and held keynote speeches at the conference “Constitutional EU-dentity 2019”. The constitutional courts of Austria, the Netherlands, the Czech Republic, Latvia, Luxembourg, Italy, Switzerland and Slovenia were represented by their presidents or vice-presidents. In addition to our foreign guests, the President of the Republic, the President of the Constitutional Court, the Minister of Justice, Hungarian dignitaries of public law, scholars of constitutional law, public administration professionals and representatives of the academic sphere also attended the conference. The matchless international professional event took place at the Hungarian Academy of Sciences. The conference offered an exceptional opportunity for the participants to facilitate the international dialogue of constitutional courts. The Constitutional Court stated in its recent decision: the applicability of the European Union’s law in Hungary is based on the Fundamental Law. During the interpretation of the Fundamental Law, the Constitutional Court takes into account the obligations binding Hungary on the basis of its membership in the European Union and under international treaties, nevertheless, the interpretation provided by the Constitutional Court shall not be derogated by any interpretation provided by another organ. The Constitutional Court also established that granting asylum to a non-Hungarian national who arrived to the territory of Hungary through any country where he or she was not persecuted or directly threatened with persecution shall not be regarded as a constitutional obligation of the Hungarian State. This, however, shall not exclude that the Parliament may grant asylum to such persons under the substantive and procedural rules it may specify. According to the decision of the Constitutional Court, with appropriate judicial interpretation the criminal offence of facilitating illegal immigration shall not be considered realised if the aim of the activity is limited to the mitigation of the sufferings of those in need and to the humanitarian treatment of such persons. To reinforce this, the Constitutional Court laid down as a constitutional requirement that the new statutory definition shall not be applicable to the altruistic conducts that perform the obligation of helping the vulnerable and the poor. The Court examined the following: on what grounds may a physical act be regarded as an expression of opinion and whether in this context pouring paint on a monument is to be protected on the basis of the freedom of expression. The petitioners of the constitutional complaint threw balloons filled with orange paint at the Soviet military memorial located on Szabadság Square in Budapest several times. According to their account, it was an act of raising attention to express their political opinion, namely their negative opinion about the Government’s policy of favouring Russia. The court of first instance established that the petitioners’ act classified as a minor offence of public nuisance. According to the reasoning, the apparently anti-social character of the petitioners’ act was at the same time suitable to incite indignation and alarm. The petitioners lodged an appeal to the Budapest-Capital Regional Court that maintained the force of the ruling of first instance. The court agreed that the political opinion can be expressed by means other than verbal ones, but at the same time the court also held it absolutely necessary that the target of the act should be clear for the bystanders – an element missing in the present case. The Constitutional Court reinforced: the citizens participate in public debates in many ways – not only in written or oral forms. The Fundamental Law protects the passing on of political opinions to others — disregarding the form of its manifestation. It is important to assess, however, whether or not a certain act falls into the scope of the freedom of expression. The Constitutional Court pointed out – taking also into account the case law of the Supreme Court of the United States and of the European Court of Human Rights – that in order to consider an act as an expression of opinion, the perpetrator’s intention of acting for the purpose of expressing his or her opinion is a necessary but not sufficient condition. The act under review should also be a communication, which is interpretable by the public. It is a special feature of monuments that they express in physical form their message addressed to the community. Monuments can be covered, unveiled, enwreathed etc. Negative opinions, protests about a monument may also take a physical form. Blemishing a monument, e.g. pouring removable paint on it may, under certain circumstances, fall into the scope of expressing opinion in public affairs, but only if the act is a communication interpretable by the public in line with the subjective intention of the person “expressing his or her opinion” and also according to objective evaluation. Even in such a case it should be assessed in the concrete case whether the freedom of expression or the protection of public order should enjoy priority. As underlined by the Constitutional Court in this case: the interpretation of the law provided by the court of second instance, i.e. that the aspects of the freedom of expression are only applicable under certain conditions to the case of pouring paint on a statue, is compatible with the Fundamental Law. The court did not violate the criteria of constitutionality when it failed to include the concrete act under the scope of the freedom of expression, therefore the Constitutional Court rejected the constitutional complaint. Judges dr. Ágnes Czine, dr. Imre Juhász, dr. Béla Pokol, dr. Mária Szívós attached dissenting opinions, while Judges dr. Egon Dienes-Oehm, dr. László Salamon, dr. István Stumpf, dr. Marcel Szabó and dr. András Varga Zs. attached concurring opinions to the decision. The full text can be accessed here and the data-sheet of the decision is available here.